Arcanum’s Conner Pohl has been named The Daily Advocate’s baseball player of the year, and Greenville’s Ally Russell has been named The Daily Advocate’s softball player of the year. 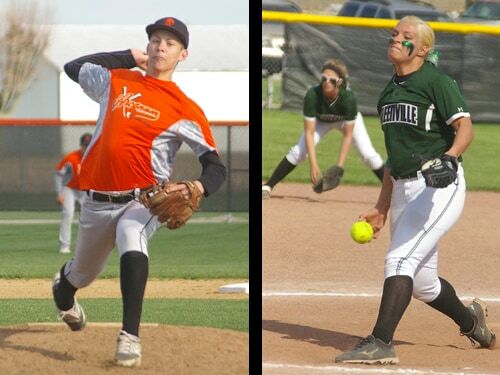 DARKE COUNTY – Athletes who excelled at pitching and hitting are the Daily Advocate’s 2015 baseball and softball players of the year. Russell helped lead the Greenville softball team to a 28-4 overall record during the 2015 season and a 10-0 record in the Greater Western Ohio Conference, helping the Lady Wave win another GWOC North championship. Russell, the lone senior on Greenville’s softball team, also helped guide the Wave to a No. 1 ranking in the Ohio High School Fastpitch Softball Coaches Association state rankings. The Lady Wave advanced all the way to the regional finals of the Ohio High School Athletic Association tournament before losing to eventual state champion Granville. “Leadership takes you a long way, especially as a pitcher,” Greenville softball coach Jerrod Newland said. As Greenville’s ace pitcher, Russell compiled a 28-4 record and a 0.97 ERA. She struck out 214 batters and posted 12 shutouts. The Greenville senior is an excellent athlete who could have played anywhere on the field, Newland said. Russell also excelled hitting as she had a .394 batting average as a senior. In 94 at-bats she had 13 doubles, four home runs and 18 RBIs. Russell finished her high school career as Greenville’s record holder for career wins as a pitcher. She was named first team all-GWOC by the conference, the GWOC North softball player of the year by the conference, first team all-Ohio by the OHSFSCA, first team all-North Region by the National Fastpitch Coaches Association and was named to the Ohio All Stars softball team that competed against the USA Junior Women’s National Team. “Just a storied career and great way to do it,” Newland said. Now that her high school career is finished, Russell will advance to the college ranks and play for Wright State University. “Her best days are ahead,” Newland said. Pohl was named the Cross County Conference baseball player of the year as he helped lead the Trojans to the conference championship with an 11-1 record during his junior season. The CCC’s player of the year honor usually goes to a senior, Baker said, but Pohl was so strong that he couldn’t be overlooked. “I think Conner had such a great year that it’s hard not to give it to him,” the Arcanum coach said. Pohl established himself as Arcanum’s ace pitcher and posted a 0.90 ERA for the season. He pitched six no-hit innings in the district championship game of the OHSAA tournament. At the beginning of the season Arcanum wasn’t sure who would be its top pitcher, but Pohl quickly secured that title, Baker said. Pohl also led his team with a .353 batting average and 20 RBIs. His RBI total was second best among all Darke County baseball players. Pohl worked really hard in the offseason to improve his game, Baker said. His play was crucial to the Trojans’ success in the regular season and postseason, the coach said. Pohl was named second team all-Miami Valley by the Miami Valley Baseball Coaches Association.